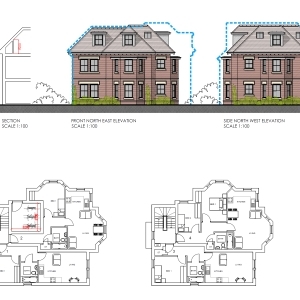 Bournemouth Borough Council: Matt Annen, director of Pure Town Planning is delighted to announce that he has recently secured planning permission for the demolition of an existing property and the erection of a block of 5 apartments in Queens Park, Bournemouth. The local area is predominantly residential in character with built forms consisting of a mix of medium to large houses, some of which have been converted to flats and a number of purpose built flatted buildings. 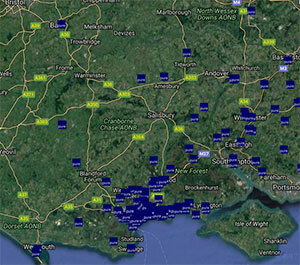 The scale of buildings in the locality range from 2 to 3 storeys in appearance. As is encouraged in urban design guidance the mass of buildings on corner sites is generally greater than on non-corner plots. The chosen design style for this scheme was purposely traditional finished in red brick with a pitched clay tile roof with bay window features to reflect the predominant architectural style found in the locality. As such we firmly believed that the scheme would not be unacceptable in principle and would not detrimentally impact the character and appearance of the immediate locality. Matt was in constant contact with the case officer arguing that a mutually agreeable development could be achieved at the site. Following weeks of negotiating, the appointed planning officer shared our view and put forward a recommendation for approval. Due to the number objections and a “Red Card” call in from the Ward Councillors the scheme was required to go to planning committee for determination. It initially went to November’s planning board but was deferred at that meeting to allow further information and assessment to be provided in respect of a couple of matters. Those matters were resolved and it went back to planning committee in January and was Approved by Members. As is evident from this process, here at Pure Town Planning we work tirelessly from start to finish to make it happen for our clients. If you are working on a residential development and are looking for a firm to steer your development through the planning process, then why not give us a call or send us an email to info@puretownplanning.co.uk for a FREE, Confidential planning appraisal.